Learn the secret of this amazing trick deck- perform dozens of tricks! Incredible magic is at your fingertips! This is an instructional DVD only. 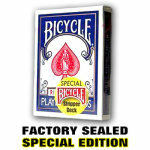 To do the tricks shown on the DVD, you need a Stripper Deck, which is NOT INCLUDED but can be purchased from MagicTricks.com. The Stripper Deck is one of the most ingenious magical tools ever devised. This DVD teaches you how to use the special secret of the Stripper Deck to perform miraculous feats - just as if you were a professional card mechanic. Wow, it's AMAZING what you can do with the Stripper Deck! DVD ONLY. You supply your own Stripper Deck.